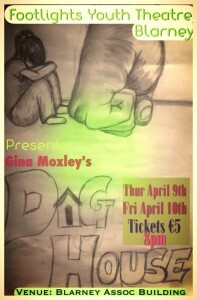 , written by Cork playwright Gina Moxley, their biggest production to date. Dog House explores the cycle of young friendships and romance in Lime Lawn, Cork City and is unaffected by the arrival of new neighbours, until the fear and brutality they live under begin to become apparent….. Footlights is a non profit making organisation and run by a voluntary committee and the students themselves. Please support as a great evening is guaranteed! Tickets are available from Blarney Chocolate Factory or on the door.